Sometimes when I am cooking and baking it is as much the process as the end result which satisfies me. This recipe takes so little effort it is never going to be cathartic but boy does it deliver the best tasting ice cream. This is a great recipe to make with young children. Besides the constant questions about how much longer until they can try some of course. Sieve (or wizz in the food processor) the strawberries. Mix the strawberry puree, cream and sugar together. If you don’t have an ice cream maker put it in a shallow Tupperware container in the coldest section of your freezer. After a couple of hours, remove it and wizz with a hand held electric whisk. Leave for two hours again and repeat. If you want strawberry chunks in your ice cream roughly chop the extra 50g and add when the ice cream is nearly set. Love making homemade ice cream and strawberry is my favorite. I’ll definitely have to try this. We’re nearly at the end of our second tub – it is tasty! 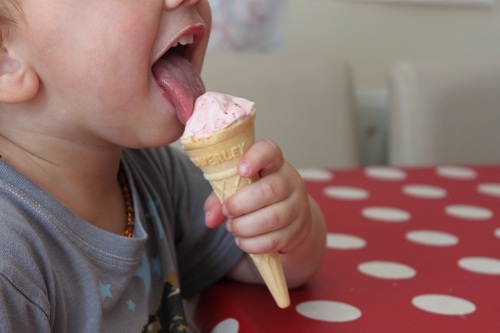 We just made some strawberry ice cream yesterday. Sooo much better than store bought! Isn’t it? I think having ice cream once in a while but homemade is the best policy.